These homemade bagels are soft and chewy on the inside, and have a nice crisp crust on the outside. Serve plain, or with your favorite cream cheese or jam. Lightly rub a large bowl with olive oil. Lightly rub your hands with olive oil. Peel the dough out of the food processor, shape it into a ball, and roll the ball around in the prepared bowl. Lay a clean dry towel on top, and place the bowl in a warm draft-free spot to rise for 45-60 minutes or until about double in size. Cut 3 rectangles of foil about 4-inches to 5-inches wide, and generously rub with olive oil. Place the foil onto a large baking sheet. Once the dough has risen, gently punch it down to deflate. Cut the dough into 3 equal segments with a sharp knife. Working with 1 segment at a time, cut into 6 equal pieces. Working with 1 piece at a time, roll it into a small ball. Tightly pinch the center with your thumb and forefinger to create a hole. Gently widen the hole until it’s between ½ - 1-inch wide. Put it on the prepared foil, and continue with the remaining dough. 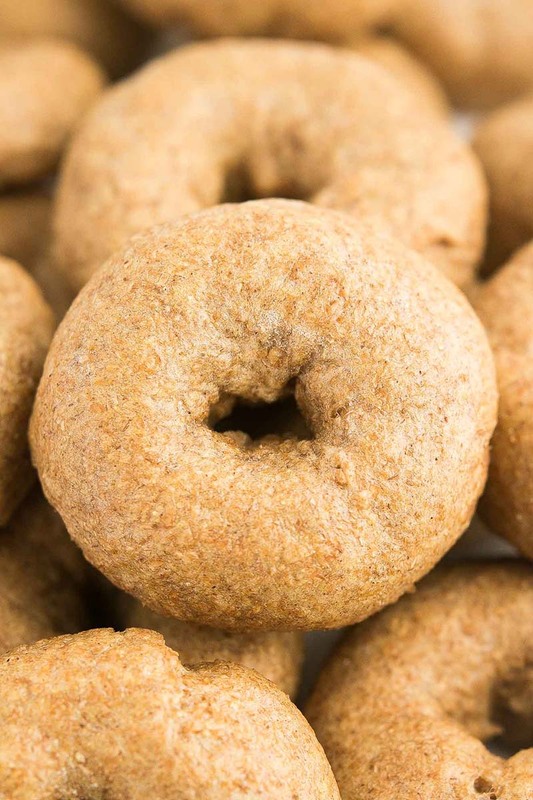 Lay the clean dry towel over the top of the shaped bagels, and place the baking sheet in a warm draft-free spot to rise for 20 minutes or until about double in size. Fill a 2-quart pot a little less than halfway with water. Bring the water to a boil. (A larger pot is fine too! It just takes more time to bring the water to a boil.) Preheat the oven to 350°F. Place a wire rack on top of a rimmed baking sheet. Working with one foil sheet at a time, carefully and very gently peel the risen bagels off, and place them top-side down in the boiling water. Boil for 1 minute. Carefully flip using a slotted spatula. Boil for 1 minute on the second side. Carefully transfer to the wire rack using the slotted spatula. Repeat with the remaining foil sheets and risen bagels. Line a large baking sheet with a silicone baking mat or parchment paper. Transfer the boiled bagels from the wire rack to the prepared baking sheet. Bake at 350°F for 16-20 minutes (16 minutes for not so crisp of an outside crust, or 20 minutes for a nice crust!). Cool on the baking sheet for 5 minutes before transferring to a dry wire rack to cool completely. Recipe created by Amy's Healthy Baking. The bagels will keep for at least 4 days if stored in an airtight container on the counter.